The Cloud Connect Module provides secure and seamless access to administer remote Mango installations behind customer firewalls or cellular connections without opening ports or using additional VPN or remote access software. Once configured with a single click of a button on your central Mango Server you can open the remote Mango systems and be fully logged in with your admin user account being synchronized to the remote installation. The Cloud Connect Module uses the popular and trusted SSH protocol to secure and encrypt all communications. User can generate their own keys using OpenSSH ssh-keygen tool, software supports RSA keys and other ESDSA parameters. ED25519 is not supported. To connect a remote Mango installation to the Mango Server follow these steps. Requires server configuration, see below. On the client tab scroll down to the Client public key and Copy to Clipboard. The port number must match the port Mango is running on on the remote device, ie port 80 or 8080 or another. Here you will see a list of all devices connected to the server. You can click the “Open web interface” button to access the web UI of the device via the cloud connect tunnel. The central Mango installation needs to be configured to accept the incoming cloud connect connections from remote Mango installations. These need to only be followed once for the initial setup. Select Start server with Mango option. Select the desired port to use for incoming connections and click the START button. 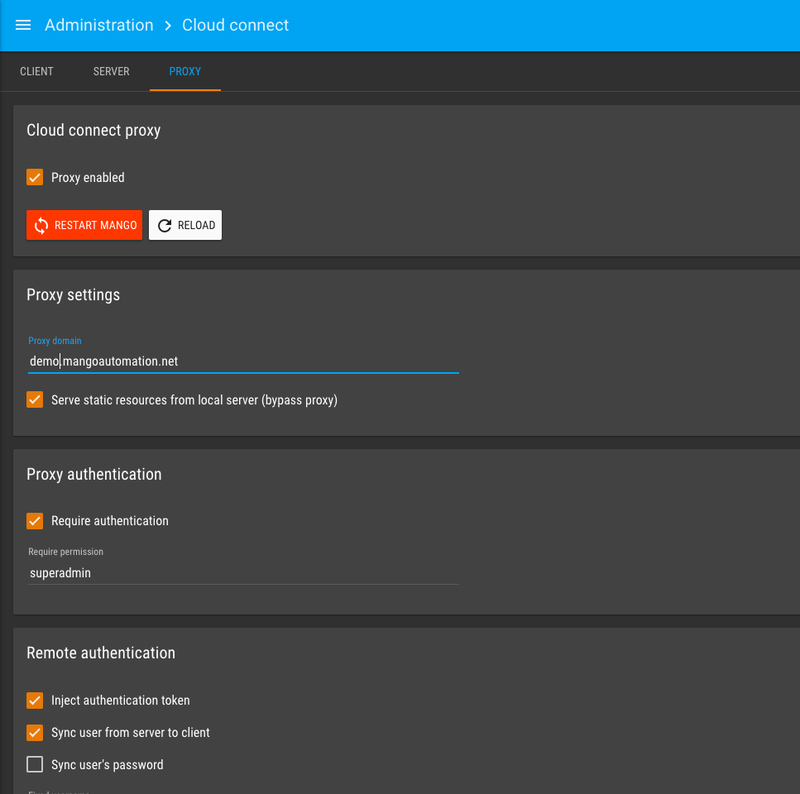 The proxy allows admin users to access the remote Mango installation via a special URL on your cloud Mango. The GUID is used in a URL such as http://1-d597d2d9-5795-342b-8f3c-072c54f89493.demo.mangoautomation.net. This special URL will open the web GUI of the remote Mango installation with the admin user being automatically authenticated so no user name or password is needed. When using the proxy you will only be able to access Mango at the domain you specify in the env.properties file.